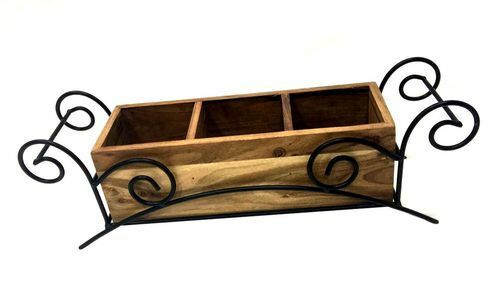 This smartly finished wooden and metal caddy nicely sorts your forks, spoons, knives, and napkins, makes room for favorite wrapped treats and candies, or keeps necessary office supplies close at hand. Very versatile! An ideal gift for any day or any occasion! We as one of the trustworthy traders in this industry engaged in providing an impeccable assortment of Indian handicrafts which includes Watch Boxes, Cake Domes, Flower Vases, WineRacks, WhiskeyCases, Wooden Bowls, Wooden Chopping Boards and many other gift items in Wood as well as aluminum, brass and iron.